● Less danger to install — Because tar and gravel systems require a hot kettle to melt large plugs of solidified tar, the inherent danger means very high insurance liability. Not only are the fumes noxious, but too many fatal roofing accidents from exploding kettles and other scorching mishaps have occurred over the years for the comfort of commercial roofing companies and their insurers. Most smaller roofing companies can no longer afford a policy that will cover T&G installations, even if they wanted to expose their workers to that kind of peril. ● Lightweight — An EPDM (rubber) roof, with insulation and fasteners, can weigh in at about 2 pounds per square foot. Compare that to 10 to 25 pounds for built-up. Plastic membranes and modified bitumen systems may weigh a bit more than EPDM, but never come close to the weight of tar and gravel. Our commercial flat roofs from A-Plus Roofing take the built-up load off the building's support structure. ● Easy leak diagnosis and repair — When the tar in a tar and gravel system, which provides the waterproofing element, begins to age, it shrinks and cracks. Two things prevent an easy repair. First, the gravel hides cracks. Second, water can travel long distances from the source of the leak to where it finally runs into the building interior. With a single-ply roof, an A-Plus Roofing Co. commercial roof repair crew need not spend a day sweeping rock around hoping to find the cracks. Usually, evidence of the problem can be discerned right away. ● Energy efficient — All the membrane roof products come with a white color option. When the roof reflects the sun all day, the building interior remains cooler, requiring less air conditioning in the summer. Also, when re-roofing with a single-ply system, it's easy to place a thick layer of foam board insulation first. An all white roof significantly contributes to a building's LEEDS certification. ● Long lasting — Depending on how much was spent on a built-up roof, they can last between 20 and 30 years. Membrane roofs can last about 20 years and longer if undamaged. With an economy-priced BUR installation, leak repairs will probably start at about year 10. 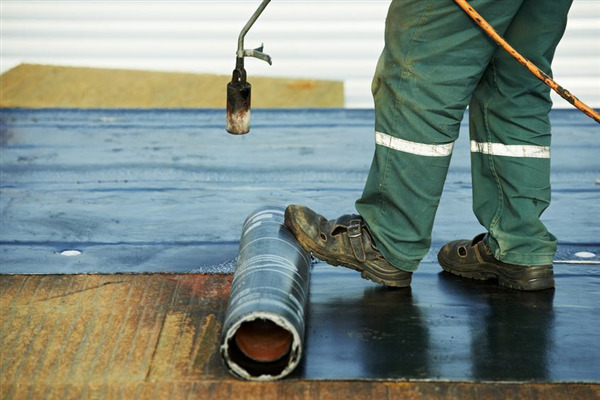 In time, they can amount to the cost of a new membrane roof. To learn more about the advantages of a membrane system, please call A-Plus Roofing at 952-894-5435 or email us today.